Wilson College received a B-. Washington Monthly's ranking of 276 out of 346 of Baccalaureate Colleges - Overall Rank was a major contributor to this grade. Wilson College is a rigorous, coeducational liberal arts college affiliated with the Presbyterian Church located 55 miles southwest of Harrisburg in Chambersburg, PA. Wilson's student body of about 800 forms a tight-knit community on this idyllic campus encompasses nearly 300 acres, and Wilson surely has one of the best student-to-acres of land ratios in the country. What is a typical Wilson College student like? Describe the type of person that should attend Wilson College. There's not usually a "typical" student on campus. Any student should have dedication to their classes and want to succeed. That's what going to college is all about. What are the top 3 reasons someone should attend Wilson College? What was a typical Wilson College student like in high school? Describe the type of person that should attend Wilson College. Wilson college is a group of unique individuals. The Division III athletes are very outgoing and friendly, and the rest of the college is also friendly, yet very unique as well. Wilson College is a private, coeducational, liberal arts college founded in 1869. The core of the Wilson experience is the extraordinary, close bond between student and professor that shapes the learning process, and the collaborative, student-focused environment of the academic program, which create an individualized education. 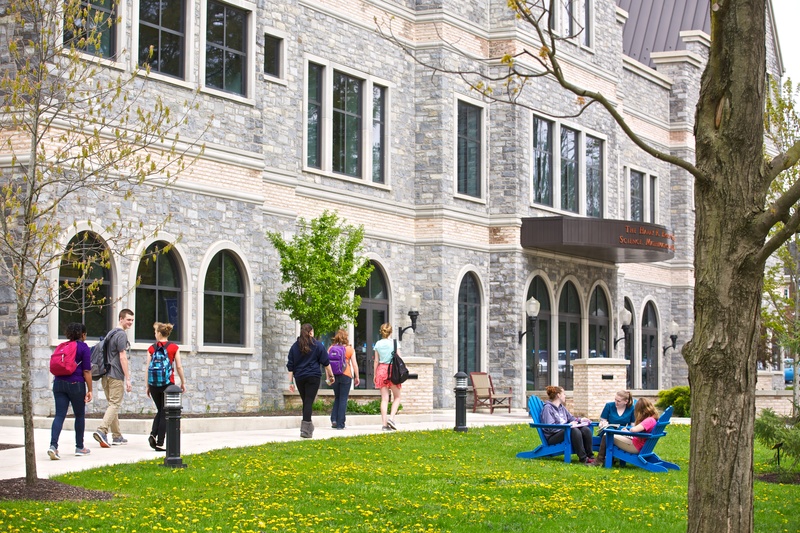 Wilson connects career-oriented programs with a rigorous, broad-based liberal arts education that teaches students to think critically and communicate with confidence, and instills a foundation for success in an ever-changing world. The College offers bachelor’s, graduate, associate and post-baccalaureate degree programs. Wilson is committed to providing its students with an affordable education that offers real value and successful outcomes. The College reduced its tuition for by $5,000 and has instituted a first-of-its-kind student debt buyback program that allows students to earn up to $10,000 toward qualifying federal loans. Access to quality education is also a priority at Wilson, where more than 100 student scholarships are available and 97 percent of students receive some form of aid. The academic program features small, seminar-like classes and a 10:1 student/faculty ratio, with 28 majors and 41 minors across disciplines. Wilson is known for the quality of its academic program and faculty. You will find career-oriented programs connected to a challenging, writing-intensive liberal arts curriculum that prepares students for successful careers or graduate education. Our academic environment encourages a collaborative culture and an incredible level of access and interaction with professors dedicated to teaching. Wilson professors are determined to influence the lives and minds of every Wilson student, believing that the best education is transformative, challenging and unique to the individual. What are the top 3 things that students do for fun at Wilson College? 45% of students received Pell Grants, which are provided by the U.S. government to students from middle and lower income families. It gives you an idea of a school’s socio-economic diversity. Campus housing is available for undergraduates. Housing deposit : $400.00. Housing deposit due : May 1. Housing deposit is not refunded if student does not enroll.. Freshman allowed to have car. Some pets allowed in dorms. Laundry is free! 45% of students live on-campus. 76% of freshman live on-campus. A program that prepares health and human service professionals to integrate the use of animals into their treatment practices in order to facilitate change in people with mental and physical disabilities. Includes instruction in psychology, psychology of disabilities, animal behavior, animal training, the human-animal bond, integration of animals into therapeutic settings, and ethical and cultural issues. A program that focuses on the scientific course study of the biological bases of psychological functioning, and their application to experimental and therapeutic research problems. Includes instruction in functional neuroanatomy, neural system development, biochemical neural regulatory mechanisms, neurological biophysics, memory storage and retrieval, physiology of cognition and perception, physiological bases of psychopathology and behavioral disorders, psychopharmacology, comparative psychobiology, and specialized experimental design and research methods. 82% of students graduated in the top half of their class. 21% of students graduated in the top tenth of their class. The average student pays $23,560 for tuition, fees, and other expenses, after grants and scholarships. Total stated tuition is $28,745, in-state and on-campus, before financial aid. Learn more about financial aid at http://www.wilson.edu/finaid. Estimate the net price for you at http://www.wilson.edu/admissions/college-for-women/financial-aid/affording-your-wilson-education/index.aspx. Wilson College participates in the NCAA Division III for college athletics. Want more info about Wilson College? Get free advice from education experts and Noodle community members. I updated our profile, hit the save and publish key, but it did not update the profile. What did I do wrong? Hi - sorry about this. Looks like we might have a bug somewhere. Could you email me at [email protected] with what you were trying to update and I can look into it.